What is Induction in math? Earlier, the mathematical induction was found in the Euclid’s proof of the infinite prime numbers. Another proof of mathematical induction was there in the al-Fakhri written by al-Karaji which was used by him to prove the properties of Pascal's triangle. Mathematical induction is a special method or technique to prove the statements given in consideration. Generally, it is used to prove the statements of the set of natural numbers. 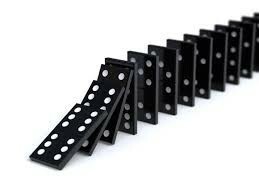 As in dominoes if we knock the first domino then it shows that the first domino falls, and if we knock any one domino then the next to it will also fall. Mathematical induction is used to prove that the given statement is true or not. It uses 2 steps to prove it. Base Case: The given statement is correct for first natural number that is, for n=1, p (1) is true. Inductive Step: If the given statement is true for any natural number like n = k then it will be correct for n = k + 1 also that is, if p (k) is true then p (k+1) will also be true. The first principle of mathematical induction says that if both the above steps are proven then p (n) is true for all natural numbers. It is more powerful than the first principle. It is sometimes called as strong induction. It doesn’t need a base case in special case otherwise it may require to show with more than one base case. In the recursive step to prove that k +1 is true, first we need to prove that the statement is correct for all the numbers less than k+1 also. Given: the statement you want to prove. Beginning Step: Show p (1) is true. Let n =1 and solve. Assumption Step (Induction Hypothesis): Assume p (k) is true. Let n = k and solve. 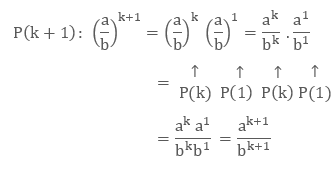 Induction step: Show if p (k) is true then p (k+1) is also true. Let n = k+1 and solve. Write the proof that p (n) is true. This shows that p (1) is true. Show if p (k) is right then p (k+1) is also right. This shows that p (k+1) is true. The principle of mathematical induction shows that if both the above steps are true then p (n) is true for all n natural numbers. 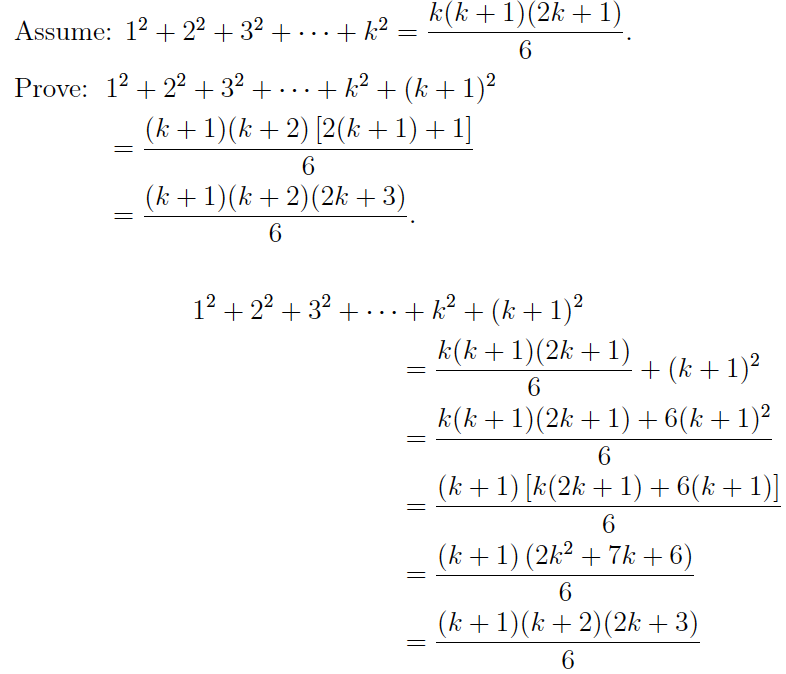 12 + 22 + 32 + · · · + n2 = n (n + 1) (2n + 1)/6 ,for all positive integers n.
Solution: Now we will use base step and induction step to prove it. Assume p (k) and prove for p (k+1). Use P(k) to show that P(k + 1) is true. 12 + 22 + 32 + · · · + n2 = n (n + 1) (2n + 1) / 6, is true for all positive integers n.
Show p (1) is true. So p (1) is true. Assume p (k) is true. Show if p (k) is true then p (k+1) is also true. Now use p (k) and p (1) to prove it. This shows that this statement is true for p (k+1) also. Hence p (n) is true. In the principle of mathematical induction when we reach to the inductive step, we need to assume p (k) to prove the statement for p (k+1).that assumption is induction hypothesis. Prove using induction hypothesis: sum of odd natural numbers is n2. Base Step is basically a statement of fact which shows that the statement is true for the first number of the set of natural numbers. If it is given that the statement is true for n ≥ 3, then we will start with n = 3 and verify that for n = 3, p (3) is true. Inductive Step is the conditional property of mathematical induction. As it is not the statement which state that n = k, but it is the condition that if statement is true for n = k then it will be true for n = k + 1 also. If we want to prove that every positive integer can be factored into prime. Let M is a subset of the set of all natural numbers. for any k ≥ l, we have 1, 2, . . . , k ∈ M implies k + 1 ∈ M.
We will show it in terms of group of propositions. Then Pn is true for all n ∈ N.
This shows that, to prove P k+1, we can assume not only that Pk is true, but that all previous Pj are also true. In this principle we do not need to start at n = 1. We can use more than one base case, to prove this step. As we know that a prime number is any positive number which is greater than 1 and which has no factors other than itself and 1. 2, 5, 11, 17, 19, 23, 29, 31. 105 = 3 × 5 × 7. Prove that every natural number that is, n > 1 is either prime or a product of prime numbers using the second principle of induction. n = p1p2 · · · pr, all pi prime. We shall prove P2, P3, . . . are all true. Base Case:  2 is a prime number, so P2 is true. Recursive Step: Suppose k ≥ 2 is such that P2, P3, . . . , Pk are all true. Hence all the numbers of 2, 3, . . . , k is either prime or a product of primes. Now we will show P k+1 is true: that is, k + 1 is prime or a product of primes. There are two options: either k + 1 is prime or not. If k + 1 is prime, then P k+1 is true. If k + 1 is not prime, then by definition there exists integers p, q for which k + 1 = pq, where 1 < p, q < k + 1. But by the induction hypothesis, both Pp and Pq are true. where p1, p2, . . . , pr, q1, q2, . . . , qs are primes. which is a product of primes. So P k+1 is true. So whether or not k + 1 is prime, P k+1 is true. Hence by the second principle of induction, Pn is true for all n ≥ 2. Both the method of induction gives the same result so that both the inductions are equivalent. It doesn’t mean that strong induction gives the better result than the ordinary induction. As both the induction gives the same result, the proof of one method can be converted into another and vice versa. Suppose we have a proof of P (n) by strong induction. Let R (n) mean "P (m) holds for all m such that 0 ≤ m ≤ n". Then R (n) is correct for all n if and only if P (n) is true for all n, and our proof of P (n) is easily converted into a proof of R (n) by weak induction. If, on the other hand, P(n) had been proven by weak induction, the proof would already be one by strong induction: In the base case P(0) is proved, without using assumptions, and in the inductive step P(n + 1) is proved, in which one may assume all earlier cases but need only use the P(n) case. It is also known as weak induction or ordinary induction. It is also known as strong induction or complete induction. It is difficult form of induction. It is the easiest form of induction. In base case ,one has to show for p(0) and sometimes some extra base case also like p(1) etc. In inductive step, it assumes p (n). In recursive step, one proves the statement P (n + 1), under the assumption that P (n) is true for all natural numbers less than n + 1.